Create stunning Microsoft office PPT Presentations with our professional templates containing a graphic of green arrow with word idea. Be the cynosure of all eyes with our template depicting the concept of idea. It is a useful captivating tool concieved to enable you to define your message in your Business PPT presentations. Create captivating presentations to deliver comparative and weighted arguments. Our Arrow With Business PowerPoint Templates And PowerPoint Themes 1012 conjure up an entertaining event. Your audience will have a field day. 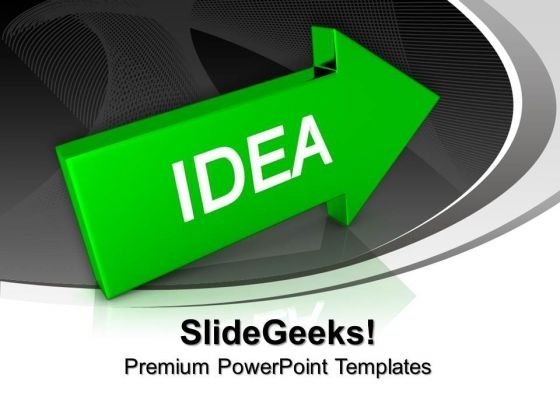 Fan audience aspirations with our Arrow With Business PowerPoint Templates And PowerPoint Themes 1012. Their confidence will flow from your thoughts.